For thousands of years before refrigerators and packaged food, people across the world needed to make food last through the winter. Starches present no problem; dried, grains like wheat and rice can last decades. Protein can also be made to last; beans can be similarly dried, meat can be salted, pickled and smoked, and of course animals can be slaughtered during the dark months. Vitamins, found in fresh plants and lasting only a short time in the body, present more of a challenge. Luckily, there are several ways to get fresh vitamins all through the winter, first by fooling the vegetables, as it were, into thinking they’re not dead yet. This year, for example, we ripped our cabbage plants out of the earth whole, roots and all, keeping some soil attached. We removed the dark outer leaves and hung the cabbages upside down in our shed, and they kept for at least two months. A thin layer of leaves grew brown and mouldy on the surface, but once those were peeled off the cabbage was fine underneath. We have also kept root vegetables in boxes of sand, which keeps the root alive and free from pests, and of course they will keep for a while without such measures. 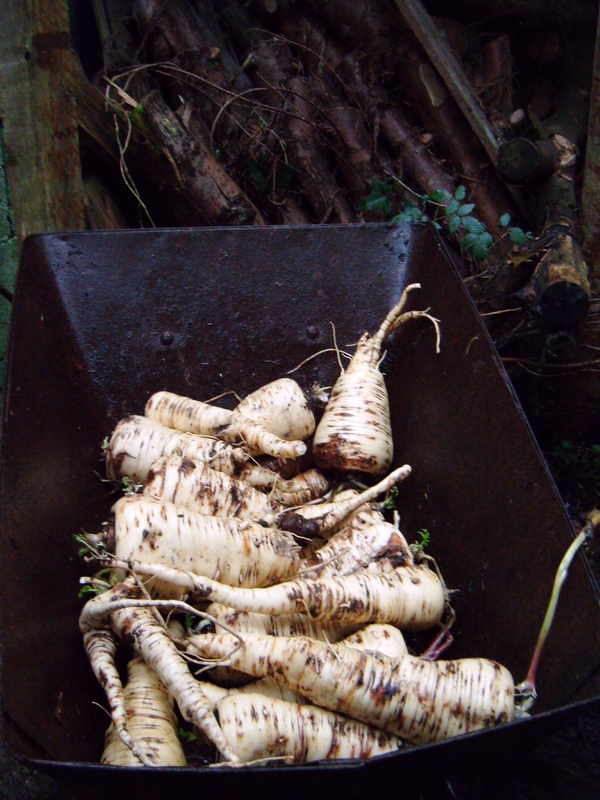 Many crops can simply be left in the earth until they are needed, and some are even better for it – we just pulled out our parsnips, as they are better when sweetened by frost. After that, you can preserve fruits and vegetables in a medium in which fungus, insects and harmful bacteria don’t want to live. You can keep some fruit and vegetables in brine, away from oxygen — salt pickles and sauerkraut. You can preserve others in an acid solution like vinegar, like sweet pickles, onions and chutneys. You can pour yeast into fruit or vegetable juice, and the yeast turns it into alcohol for us, preserving it indefinitely. You can preserve fruit or vegetables in a high-sugar solution, as syrup or – with pectin to firm up the consistency – jam. All these methods preserve food that was grown in earlier months, but you can also continue to grow fresh food though the winter months. One method is to grow sprouts – not Brussels sprouts, but beans or seeds that have been soaked in water and begun to germinate into seedlings, as they would in soil. Sprouting might be the only kind of kitchen gardening that almost anyone can do, almost anywhere. Growing your own food sounds great for rural and suburban landowners, but presents problems for urban flat (apartment) dwellers, renters, lodgers, squatters and prisoners – and more of us might find ourselves in one of those categories in the tumultuous decades ahead. 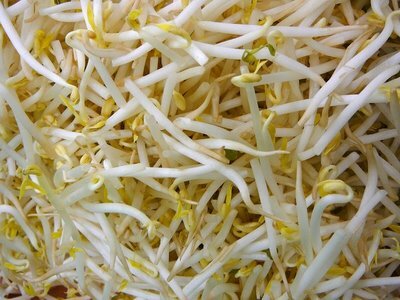 Sprouts, however, require no land, yard, garden, tools, infrastructure or practice. You can grow them for almost no money – a 500g bag costs me 1.60 euros, or about 40 cents per lunch. They grow in plastic bags, pottery, bowls or almost any other vessel. The vessels can be placed on a shelf, in a desk drawer, under the couch, in the boot of your car, in a closet a hole in the ground or any other cool dark place. The crops come to fruition in a few days rather than a few months, and can be eaten with no cutting, peeling, cooking or preparation. What I’m getting at here is, you have no excuse for not growing sprouts. You can sprout the beans or seeds of most edible plants – I favour mung beans — but avoid any plants whose leaves would be toxic, like tomatoes or potatoes. The details of how to sprout will vary depending on what kind of seeds and containers you have, but the basic idea remains the same – keep the seeds wet until they are a good size to eat. School-children are often told to let them lie on a wet paper towel, but I use plastic throwaway tubs from an Indian restaurant in a nearby town. The tubs have a sealable lid, and I poked two holes just below the lid on either end. The holes are high enough that I can submerge the beans in water, yet allow the soaked beans to breathe – plants need to breathe just as we do, and an airtight container risks creating dead and moulding sprouts. In my case, I rinse the beans first, and then let them sit in a tub of water for about 12 hours or so – it can be as little as three hours or as much as 24, but 12 seems to work best for mung beans. Then drain the water and let the beans sit in the damp tub for the next few days, rinsing them at least once a day and preferably twice — the beans need to be kept moist but not swimming in standing water. Every evening when I come home from work – and every morning when I have time before catching the bus – I fill the tubs with water, turn them on their sides, and let them drain. If you forget for a day or two the beans will probably recover, but tend to start growing roots, making them tougher and less tasty. In addition to mung beans I recommend lentils, although they grow a day or two more slowly and I find them less tasty. I occasionally sprout the seeds of fenugreek, broccoli, alfalfa, or clover, but generally find them too expensive in this country for the small amount of sprouts they yield, and they run a higher risk of moulding before fully sprouting. I found larger beans a problem — Adzuki beans were even slower and less tasty than lentils, and soybeans – the common sprout of Chinese stir-fry – has a tendency to decompose before there is enough living sprout to make it worth my while. You can grow other indoor crops besides sprouts, however. Chicory, for example, makes a great winter salad, and can be grown in your closet. Start by planting chicory in your garden in spring, and letting its broad green leaves grow out all through the summer and autumn. These green summer leaves are edible, but left uneaten; you need them to slowly feed the root underneath. Then, around November, decapitate the leaves off the plant, dig up the now-massive root, plant it in a bucket of soil and set it in the closet or other cool, dark place. 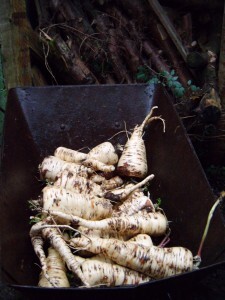 Plant the top of the root even with the surface, and make sure the soil is damp but not soaking. Place another bucket upside-down over the first one to make sure it is kept dark inside. The plant has spent all year storing energy in the root to grow more leaves in spring, and when placed in warm soil begins to sprout vitamin-rich leaves. The leaves will be white and with a milder flavour than green chicory, although still slightly bitter. Ideally, you should get a full head of white leaves, like a small cabbage, in a few weeks. Our leaves weren’t so tidy – they came up at different speeds and looked more like an unkempt head of hair — but tasted fine all the same. You should get a few crops of the chicory from each root, and if you grow many plants and stagger their crops you can have a continual supply of winter vitamins. This crop is not as widely applicable as sprouts, for to get the roots you first must have a bit of land and patience to grow the leaves through the year untouched and then see if you can get results from the roots. Also, I just learned this week to check your chicory regularly and harvest the leaves regularly; leave them for a few days, as I did, they can go bad quickly. Still, the leaves are excellent as a thinly-sliced salad mixed with cabbage and celery, in a white sauce of either mayonnaise mixed with lemon juice or – if you want a lower-fat option – home-made yoghurt. You can add a bit of cumin or vegetable stock to make it more savoury, or dill and mint for a cooler flavour, depending on your taste. We in the modern West have grown up surrounded by mountains of food – grown, picked, processed, preserved, cooked and refrigerated for us, and in such quantities that a third of it is through away uneaten, and obesity presents a major health crisis. Fossil fuels made this brief state possible, and now that we see their end on the horizon we must reacquaint ourselves with the more basic methods of getting nutrition — ideally allowing more of us, not just to survive, but to eat well.